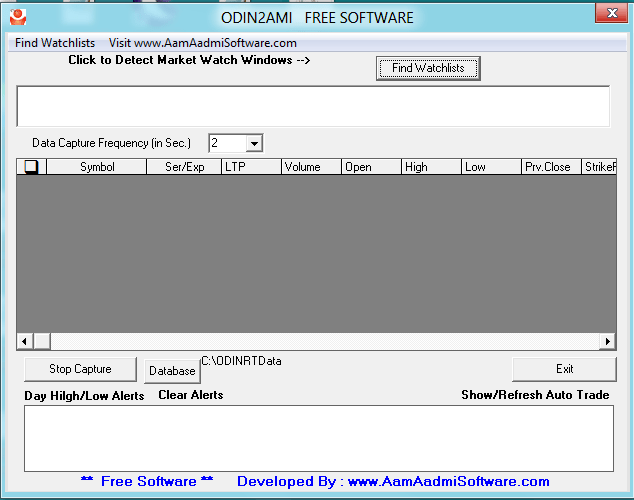 Odin2Ami is free and tiny windows application from aamaadmi software which fetches realtime data from DietOdin to AmiBroker. Currently the free version is available for personal use only. -Feeds NSE Cash,Futures , Commodities data to NinjaTrader or AmiBroker from DietOdin. -Continuous contracts for NSE F&O scripts. Rajndran, it’s not free s/w. Only a week’s free trial is there. Rajandran, It’s Not free. Only a week’s trial is free.It’s mentioned on website that 250pm is charge. But the software is mentioned as free utility. Even the Tiny utility doesnt ask for any License. Can you provide me the link where it is mentioned 250 per month? can we use it for NOW to AB? Sir, what is your email address? it’s Free Utility for whole life….without backfilling. @Ricyraj, Is it free ?Because on their website it’s mentined 250rs/month. OTOH u mean that it’s free without backfilling. In such case do they provide Futures/MCX coz similar free applications don’t provide Futures. Waiting for your or Rajandran’s reply. Its a paid version earlier. Got information from one of the subscriber that its goes a free version. May be for popularity they may be doing this. Odin2ami is totally free for lifetime. and other utility calld SQA is paid Software. like EOD data fro NSE/BSE/MCX/NCDEX/FII/DII, capture from ODIN Diet/Client/Angle diet/NOW/NEST/IIFL with Backfill Support for all inclusing ODIN 10x version using XML Files. Kindly upload help file or video explaining how to import odin data into AB , via odin2ami software . Is there any Infoline feed to Amibroker Live ?????? Its any free real time data feeder from nest to amibroker? Manshi RT and Shareguru are same people. Their customer support is worst they never support clients be carefull. Try chat support and see how quickly that fellow closes the chat. Mr. Rajendran , we get data from Odin to O2A feeder but it does not feeds in Ami.Pls explain how to run data from this utility to Ami.I shall be obliged to you. software is no more working. Can you please point me to the right doucmentation?. I like to update the intraday data and watchlist from my c# applicaton to Amibroker.